Glens Falls, N.Y.—For this year&apos;s Community Day, The Hyde Collection is taking fine art to the streets, then back to the Museum. From noon to 5 pm Sunday, August 12, Community Day includes a friendly family competition, a scavenger hunt adventure, tours, and more — and serves as the culmination of the Museum’s inaugural Plein Air Festival, three days of artists painting al fresco throughout downtown Glens Falls. The events are inspired by the Museum&apos;s summer exhibitions, Jane Peterson: At Home and Abroad and Changing the Landscape: Women Artists from the Thomas Clark Collection, which open Sunday, August 5. "Having the rich colors and vivid landscapes of these incredible artists — many of whom painted outdoors — in the galleries gives us a wonderful opportunity to ask regional artists to highlight our beautiful city," said Anne Saile, interim director of The Hyde. 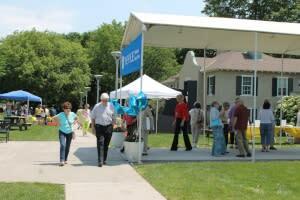 Artwork created during the Plein Air Festival will be exhibited during The Hyde&apos;s Community Day celebration. Best of Show and awards in Nocturne, Waterway, Streetscape, Historic Buildings, and Outdoor Still Life categories will be announced at 3 pm. "Community Day has always been a way for us to offer the public even more ways to experience art," said Jenny Hutchinson, educator at the Museum. "Plein Air Festival really builds on that: People walking downtown can stop and watch an artist work over the weekend, then go to the Museum and see the finished product. It gives everyone a way to be part of the creative process." Artists from the community are also encouraged to create their own plein air work; to participate, register with collaborative partner Plein Air Adirondack. Community Day also includes a full day of activities for all ages. Families of any configuration are invited to compete in the Family Art Battle. Between noon and 2 pm, pick up a kit of supplies from The Hyde’s education team, create a collaborative artwork, and be entered to win a Family Membership to the Museum. At 1 and 4 pm, Museum educators will offer a Family Tour and Gallery Activity of Jane Peterson: At Home and Abroad and Changing the Landscape: Women Artists from the Thomas Clark Collection. Throughout the day, docents will offer tours of Hyde House and visitors can put what they learned to the test with a Scavenger Hunt on the Museum’s Guide by Cell audio tour app. "This is a great introduction to The Hyde," Hutchinson said. "If you haven&apos;t been to the Museum in a while, there&apos;s always something new to see. If you think art museums are stuffy institutions where you have to be dressed up and whisper about art history, let us show you that there&apos;s so much more here. We want you to have fun, to engage with the art, and to be inspired." Food and beverages will be available for purchase from Corner Kitchen Café. Stewart’s Shops will provide ice cream.